We have been approached by SMS-Automation, a company involved in automation of enterprises in power, petrochemical, food and other industries in various regions of Russia and CIS. We have been entrusted to create a logo and an application icon for Infocont software system. First, we got really excited but then we realized how tough and responsible that mission was. Initially we had to grasp the functionality of this software system and its main purposes. It happened to be nothing less than an Enterprise Manufacturing Intelligence solution. The logic behind such systems lies in reducing chaos and retrieving information from disorganized data by making it more convenient for processing. Such systems give users the possibility to move from an array of sporadic data with a vast number of interactions to a clearly structured picture of production processes. 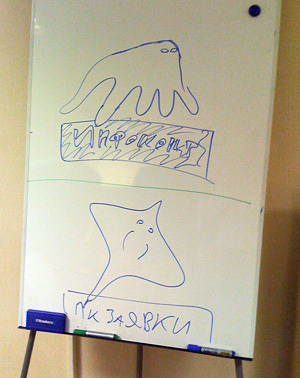 So after our designers’ headaches subsided after all these complexities, we decided to draw some sketches. Cthulhu sucking the information from the myriads of long and entangled tubes. Pyramid split into levels. The pyramid itself serves as a good illustration of the idea of uniting data from various sources. Simplified pyramid in a transparent sphere. The accents are slightly shifted here: the most important thing here is not hierarchy but the ability to rotate the shape in any direction and to view the information from any angle. You might want to think about using an octopus, which is not letting anything to pass by. It has one head and many tentacles and is able to retrieve a number of things at the same time (food, information, etc.). It may serve as a metaphor of integration and aggregation. Aside from the animal theme and some obvious semantic match it features one clear advantage: we are creating a hero. It may appear in presentations, be distributed as a souvenir (you can buy a hundred of octopuses in a toy store and hand them out at some conference), or be used just for fun. Later we sketched out various octopuses balancing between funny-cartoonish and cruel-formidable images. 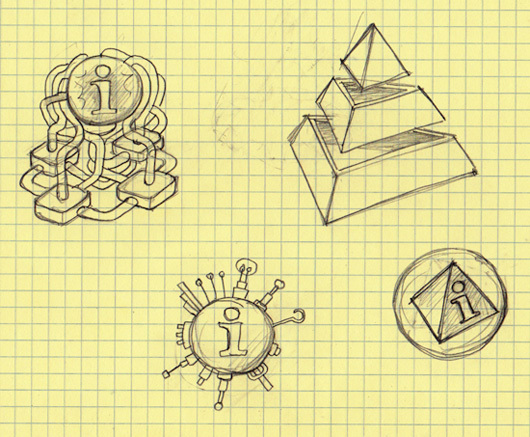 Then we drew a Windows icons in four sizes based on the sketches. 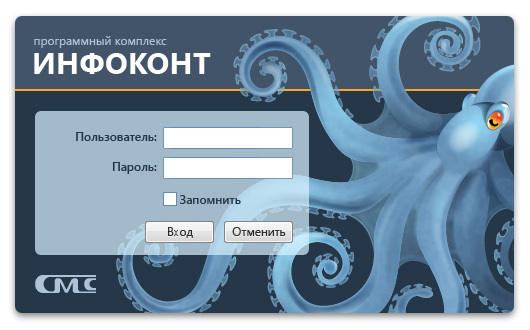 Then we drew an alarming login window. As it happens Infocont system contains additional modules: Designer and Configurator. 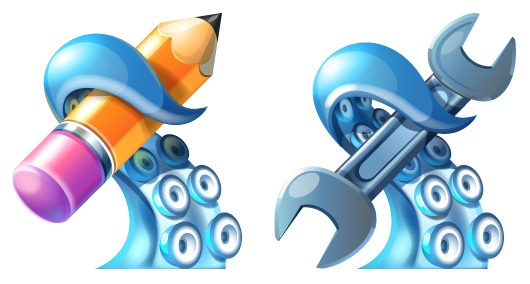 So we also created icons for these applications. We are happy that Infocont’s logo turned out to be so bold and unusual. Honestly, it appears more like a character, but it is rather a benefit.